From written records it seems certain that the domestic cat first arrived in Japan from China or Korea at least one thousand years ago. The Japanese Bobtail breed has certainly existed in Japan for many centuries. Japanese Bobtails have appeared on paintings, sculptures and building facades in their native Japan for hundreds of years, perhaps dating back to the 11th century. Nicknamed "bobs", statues of these cats still represent hospitality and good luck. Their unusual, four-inch, tightly-curled tail resulted from a mutation that appeared long ago. In what was once Siam, cats were enshrined with members of royal houses. When a ruler was buried, his favourite cat was entombed with him. The roof of the burial chamber had holes in it, through which the cat could escape, taking the soul of the monarch with her. Such sacred cats were treated like royalty for as long as they lived. The Temple Cat has also been called the "Kimono Cat" because it is traditionally all white with an ink spot on its back (it is said to look like a woman wearing a kimono). Any feline born with such markings is considered sacred. Japanese Bobtails are strong and healthy cats. They usually have litters of three to four kittens that are extremely large for newborns. Compared to other breeds, they are active earlier, walk earlier and start getting into trouble earlier. This breed has a low kitten mortality rate and high disease resistance. Kittens are never born tailless, nor are they born with full tails. They are active, intelligent, talkative cats. Their soft voices are capable of nearly a whole scale of tones; some people say they sing. Since they adore human companionship they almost always speak when spoken to. They like to carry things in their mouths, and most enjoy a good game of fetch. Masters of the pounce, these cats love to ride on shoulders. They are good travellers. They do not panic at shows or strange hotel rooms, they adjust to dogs and other animals, and are especially good with children. 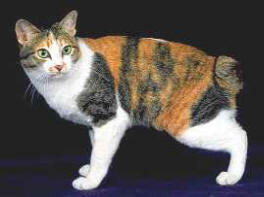 The longhair Japanese Bobtail exhibits all the same characteristics as the shorthair Bobtail. According to an old Japanese legend, the colour of a cat's fur indicated its powers of sorcery. Reddish cats were the most adept; white-brown-black mixes were second; and third place went to the black-and-white cat. Basho, a Japanese seventeenth-century diarist, celebrated cats in poem and paintings. One of his earliest pieces is an example of the traditional Japanese verse form Haiku. It is never longer than 3 lines, contains only 17 syllables and yet creates imagery in the mind of the reader. The tail is unique not only to the breed, but to each individual cat. Like our finger prints, no two tails are ever alike. China Cats depicting the "Japanese Bobtail" breed are often placed in shop windows in Japan. They have one paw raised in greeting and are called "Maneki-neko", or "Welcoming Cats." They are thought to bring good luck. The Japanese bobtail can wear any coat pattern except pointed and ticked, though solids, bicolours and particolours are preferred. The Mi-ke pattern (pronounced mee-kay and meaning "three fur"), which displays red, white and black colours (tortoiseshell), remains the most cherished. When a cat was born with these colours the animal was considered lucky. in Japanese Art the Mi-ke was often painted with one paw upraised as a gesture of goodwill.